After a unusually long season toggling between St. Croix and Hawaii, the Hurricane Hunters are packing up their equipment and will return to home base at Keesler Air Force Base in Mississippi after a public open house Saturday. 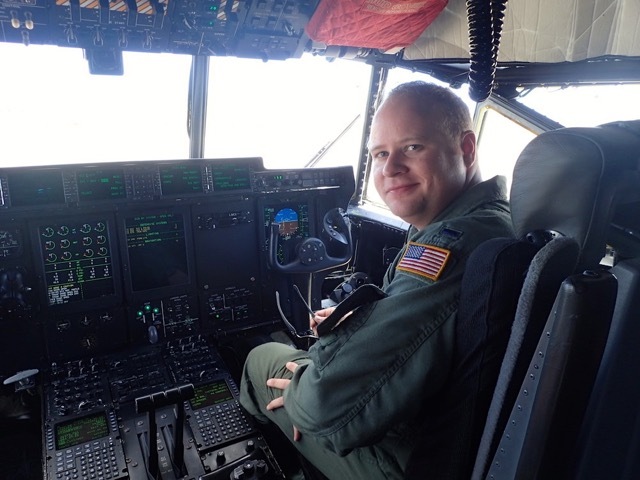 The 53rd Weather Reconnaissance Squadron – the Hurricane Hunters – began investigating tropical storms in May and flew a winter-storm mission into the gulf that would possible affect the northeast on Thursday, according to Master Sgt. 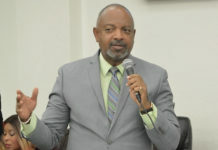 Brian Lamar, public affaires officer. Typically hurricane season runs from June 1 through November, with possible overlap on either end. This year, Tropical Storm Ana kicked off the season May 8; a major hurricane, Andres formed May 28 in the Pacific; and another major hurricane, Sandra churned in the Pacific from Nov. 23-28. 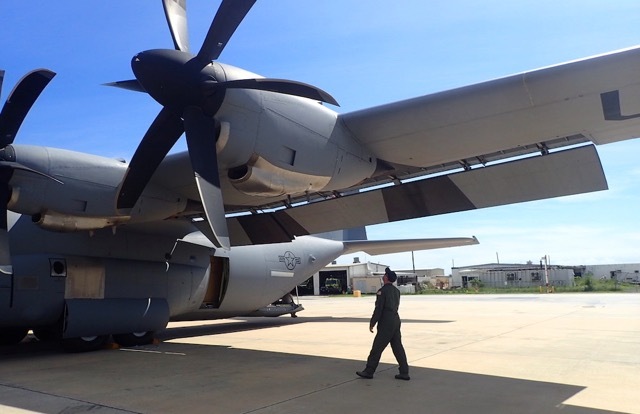 Each year specially equipped WC-130J aircraft make several trips from Keesler AFB to St. Croix transporting generators, tires and other equipment to be used during flights into severe tropical weather for the next few months. There are 10 full time crews from Keesler and 10 crews from the 403rd Reserve Wing at Keesler that rotate during a storm. When a storm, or “invest,” threatens the U.S. mainland or its territories, the National Hurricane Center notifies the squadron and at least one five-man crew heads south immediately. In 2015, there were 11 named storms in the Atlantic basin with four becoming hurricanes. Hurricane Hunters sent 17 missions into TS Erika and Hurricane Joaquin and 11 flights into Hurricane Danny. Other sorties deployed for Hurricane Danny, Tropical Storms Bill, Fred and Kate. Although no hurricanes made U.S. landfall, Ana and Bill struck South Carolina and Texas, respectively, and Hurricane Joaquin impacted the Bahamas in October. In between missions in the Atlantic, the Hurricane Hunters conducted almost three dozen flights into Pacific storms. Their mission is to cover the area east of 140 degrees west longitude from Hickam Air Force Base in Hawaii. The National Hurricane Center recorded 18 named storms, 13 hurricanes and nine major hurricanes in the Eastern Pacific during the 2015 season. It was the highest number of major hurricanes in the area since 1971. Hurricane Patricia spun in the Pacific in October and became the strongest hurricane on record in the western hemisphere with sustained winds of 205 miles per hour, gusts up to 250 mph and air pressure at 879 millibars. Lamar and Air Force Reserve pilot Michael Plash flew into Patricia, as well as several other storms during the 2015 season. “That was my roughest flight. You could definitely tell the plane was fighting. It was pushing us around a lot and, when we went into the eye, I felt the low pressure. And there was a decent amount of lightning,” Lamar said. Hurricane Patricia made landfall near Puerto Vallarta, Mexico, and 50,000 people were evacuated. There were no deaths and Patricia dissipated quickly after encountering mountains near the coast. “That means everybody did their job. That’s exactly why we do this job,” Lamar said. Plash flew into TS Ana, TS Bill and Hurricanes Danny and Erika in the Atlantic as well as Patricia. He didn’t distinguish one storm from another and calmly described why he likes his job. “I just like flying. You get to see a lot of new things every day,” he said. Next May, the C130’s will again lumber down the runway at the Henry Rohlsen Airport and off load supplies and equipment for the 2016 hurricane season. Until then, the hanger will remain closed. 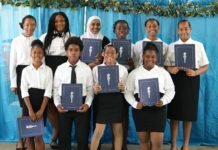 Before the last aircraft leaves St. Croix on Sunday, the public is invited to tour the plane Saturday between 9:30 and 11 a.m. at the Hurricane Hunters hanger East of the main terminal.